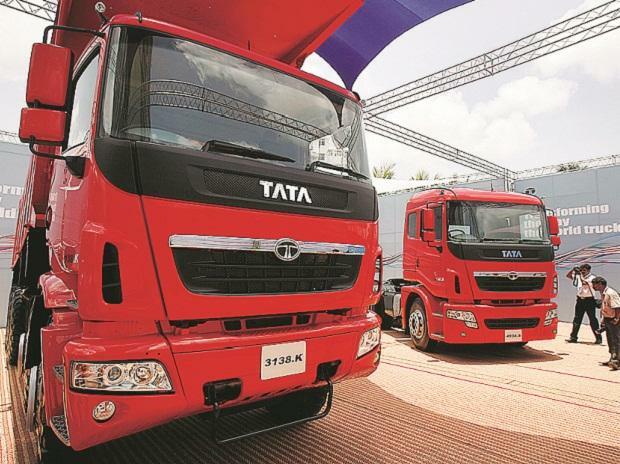 Tata Motors, the country’s biggest commercial vehicle maker, has largely arrested the declining market share in most segments of the business. In fact, the company has increased its share in light commercial vehicles (LCV) while maintaining the share in medium and heavy commercial vehicles (M&HCV) or trucks. This has helped its domestic business turn profitable during the October-December quarter after five successive loss-making quarters. The company reported a standalone profit of Rs 1.83 billion in third quarter of FY18 against losses of Rs 10.46 billion in the corresponding quarter of the previous year. Standalone revenues (domestic business) for the quarter rose 59 per cent to Rs 161 billion. The Ebitda (earnings before interest, depreciation, taxation, and amortisation) of the standalone business margin improved 750 basis points to nine per cent during the quarter. Girish Wagh, president of the commercial vehicle (CV) business unit at the company, said the CV business was a key contributor to the turnaround. “There were tailwinds in the market and that certainly helped. But we have undertaken a very aggressive cost reduction programme. That has also started giving us dividends. We had estimated a four-digit reduction in costs (at least Rs 10 billion) during the year and a significant portion of the gains have come. We will get a cost reduction next year as well,” Wagh told Business Standard. The company’s M&HCV segment clocked a growth of 55 per cent in domestic sales to 45,895 units in the third quarter, according to Siam data. The LCV segment (for goods) has also expanded by 42 per cent to 51,094 units in the domestic market. CV business accounts for over three-fourths of the domestic revenue for the company. But this business had been losing market share in the last three-four years. For instance, the share in M&HCVs came down to 51 per cent in FY17 from over 58 per cent in FY14. The share in light commercial vehicle (goods) came down from 49 to 39 per cent in the same period. In the LCV (passenger) segment too, the share shrunk from 39 per cent to 30 per cent. The loss of the CV market was a key point of friction between the group and former Tata Sons chairman Cyrus Mistry. The share this year, however, has been stable while seeing an improvement in the LCV segment. Against a share of 51.2 per cent in M&HCV during FY17 (full year), the April-December share of FY18 has been 51.75 per cent. Similarly, the share of LCV (goods) has improved from 39.20 per cent to 41 per cent. “The decline has been arrested to some extent. But we could have done better had we not faced some supply constraints. There have been shortages in supply of engines and sheet material, as our production is continuously increasing. In next financial year, this would be completely addressed,” Wagh said. He added that the company has managed to prioritise production and improve execution rigour. "New products have come in and we have filled the white spaces," he said. Wagh said the competition has become very fierce and the company has therefore focussed on a stronger customer engagement on a continuous basis. “We have focussed on improving dealer profitability through incentives and retention margins during the second and third quarter. Dealers have also become aggressive. This has also helped,” he explained. The company also said discounts on CVs as a per cent of the list price have gone down in the second and third quarters. “We have been focussing on multiple areas apart from cost reduction, so that the margin is protected and enhanced. Our margin has actually moved up this year,” said Wagh. Wagh said he is now looking to increase the market share. The company has over 1,400 touch points for CVs. “We continue to expand the network as new centres of demand are emerging. It is essential to be closer to such centres to capture the demand,” he added.